So, we have a new category on the blog. I am wondering which user to assign it to? 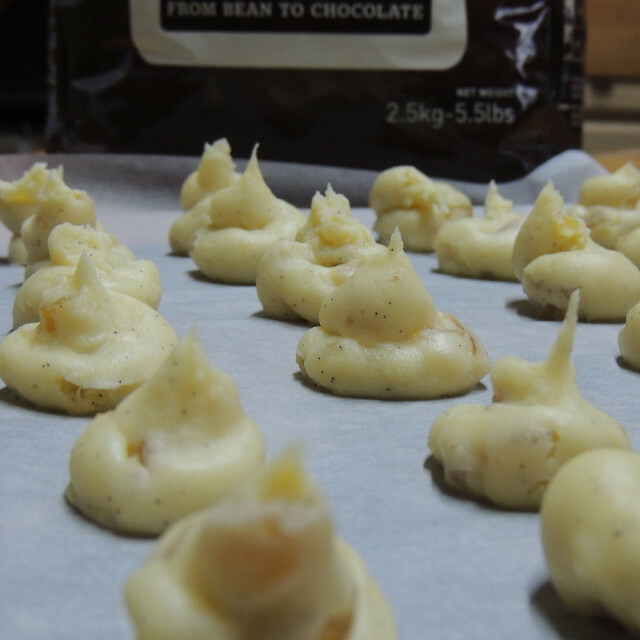 It seems tidier to allocate chocolate-making to the kitchen user, even though she set out simply to make bread. The chocolate couverture finally got here on Monday morning. I calmed my impatience and spent some time in reading. Today I made ganache. 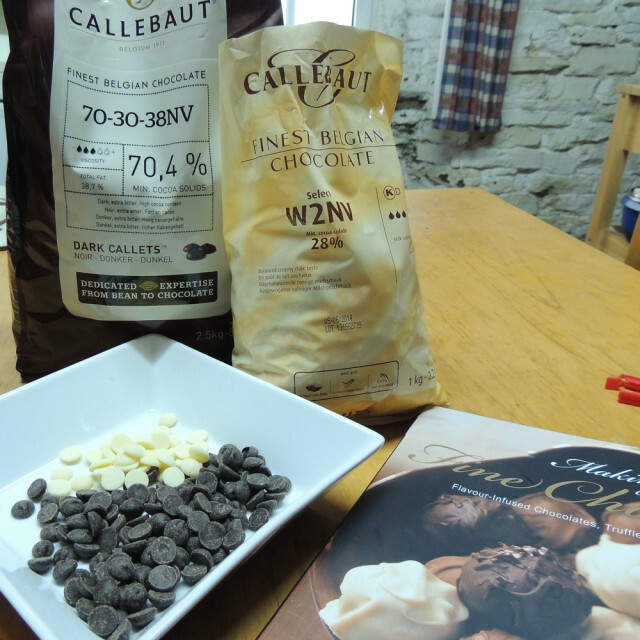 This is what I stocked up with initially: 2.5 Kg of Callebaut Dark chocolate callets and 1 Kg of their White chocolate callets. 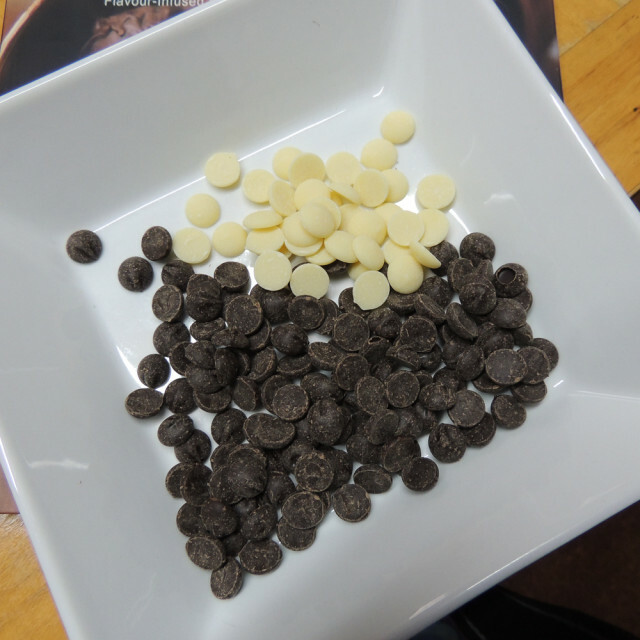 I had been expecting the large ovals, but these are wee chocolate drops. What to make first? That was the question. I looked about the kitchen for some flavour inspiration. Yes, I could have (should have?) stuck to a recipe from my new book, but where’s the sense of adventure and creativity in that? I definitely fancied a white chocolate centre, with a dark coating. What flavours would work? Years ago, I used to make a gelatine-set soufflé recipe. It was aeons ago, really – I first made this confection in A-level Home Ec. but I can still taste it. It was called Soufflé Chinoise and was made from a good vanilla custard, with the addition of stem ginger. Vanilla and Ginger, both will marry with either the white or the dark chocolate. I considered this to be a fail-safe combination for my first attempt. I lifted the quantities and the method for the ganache from my book. It was not straightforward – there is so little cream involved that it failed to melt the chocolate and I had to set up a quick water bath to rescue things. Then I forgot that I should be treating my mixture gently… over-stirred it and went right to the edge; it all but split on me. I also slightly over-nuked my butter and it was beginning to melt about the edges. It did combine with the chocolate and cream though, without disaster. There was one particularly hairy moment when I could not find my digital thermometer. It turned out that somebody has been using it in the bathroom in order to get the water at the right temperature for our bath! My ganache does not look completely appealing but I am sure that I shall improve my technique with practice. I should have chopped my crystallised ginger into smaller pieces but I don’t mind chunky ginger – it just hampered the piping process. My little spirals of ganache are a tad on the large side – this recipe should have made 30 truffles without the addition of a bulky ingredient. I managed to get 27 out, including the ginger. My eyes are no doubt larger than my tummy. 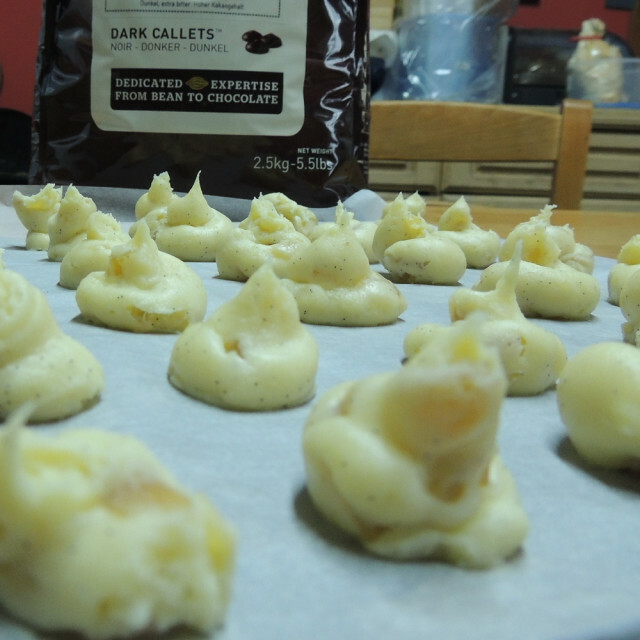 Don’t fret about the peaks – these truffle centres get hand-rolled prior to finishing. The ganache is drying out overnight and I’ll try my first tempered coating tomorrow. In the meantime, the first batch of ganache used very little cream and I do not want to waste what remains, so Mr L and I are going to make up some dark chocolate ganache this evening. We are currently pondering what flavour(s) to add.